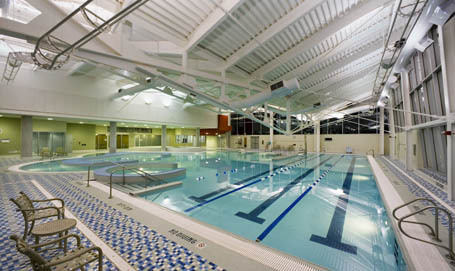 The University of Illinois at Chicago opened the doors to this state-of-the-art student recreation facility in May 2006. The design team of Counsilman-Hunsaker, PSA-Dewberry, and Moody Nolan designed the new aquatic facility with leisure and fitness programming objectives to fulfill the university’s goal in providing their collegiate community with a complete aquatic package. Other programming spaces include a three-story climbing wall, multi-purpose gymnasiums, running track, fitness center, and racquetball/squash courts.